”We took the opportunity to include some upgrades to allow us to include a broader range of pea protein products to better serve the continuously growing market demand,” said James Bozikis, Roquette’s head of communications and public affairs for the Americas in an email. Bozikis said the company wants to provide a broader range of products to meet more applications. “You only get the chance to build once – we wanted to ensure we had included all we could in to the plans before we started building in earnest,” added Bozikis. The C$400 million pea-processing plant was originally announced in January 2017 and the France-based company broke ground on the project in September 2017. Originally it was to operational by April 2019, but that was later changed to mid-2019 and then 2020. Bozikis confirmed the plant is now to be operational during the second half of 2020. Once in full production the plant is expected to process approximately 120,000 tonnes of peas annually. 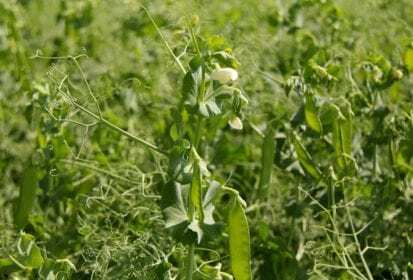 According to Statistics Canada, there were 3.6 million acres of peas seeded this year nationally. Of those, 85,000 acres were in Manitoba and 1.9 million acres in Saskatchewan. Despite Manitoba’s low acreage, Portage la Prairie was chosen as the location for the Roquette pea-processing plant due to the area’s business environment according to the company. “While we may process peas from other provinces, Portage offers an ideal business environment to accelerate our development and contribute to further developing pea production in Manitoba,” Bozikis said. Roquette is hoping pea acreage will increase in Manitoba, but according to Gordon Bacon, chief executive officer of Pulse Canada, the financial incentive will need to be there for farmers for that to happen. “It’s not the gross returns; you really have to look at net returns. You have to look at what your seed costs are. What your fertilizer costs are and what other inputs you have,” Bacon said. Also crop rotation could play into more peas being grown. “You can’t grow canola continuously without risking a higher level of disease. That’s the same with cereals. That’s the same with pulses,” Bacon said. Prices for peas took a tumble in November 2017 when India imposed tariffs of 50 per cent on pea imports. Producers had been getting over C$8 per bushel, but were suddenly faced with prices around C$6.50 per bushel. “Believe it or not, and beyond my explanation, it has climbed back up. We’re getting C$7 a bushel on yellow peas,” said Allan Johnston, president of Johnston’s Grain in Welwyn, Sask. For green peas, Johnston said the price is up to C$9 per bushel delivered.